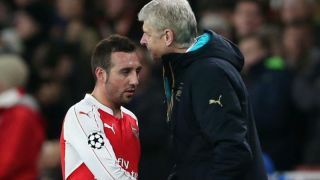 Former Arsenal midfielder Santi Cazorla has opened up on an ‘incredible gesture’ that he received from Arsene Wenger as he began his battle with injuries. The 33-year-old has since returned to Villarreal as he has finally made his comeback after an injury hell during the final years of his stint in north London. Cazorla ultimately ended up playing his last game for Arsenal in their Champions League meeting with Ludogorets in October 2016, with an ankle problem dogged by infection keeping him sidelined and seeing the issue became increasingly concerning and dangerous. However, in a real classy touch from Wenger and the club it has to be said, they exercised the option to extend Cazorla’s stay at the Emirates for an additional year regardless of the injury problems that he was suffering with. That didn’t go unappreciated by the Spaniard as effectively, he was given ‘peace of mind’ to not only focus on his operation and recovery but was also safe in the knowledge that he still had a contract in place to ensure that he and his family were still in a sound position off the pitch. Given it was likely at that point he would be out for a considerable amount of time, albeit Arsenal and Wenger probably didn’t envisage that it would be for as long as it eventually was, it was undoubtedly a classy move from the Gunners and the French tactician. The respective parties have all now moved in different directions, but as he hopes to continue to compete at the highest level in Spain this season, Cazorla will seemingly continue to look back on his time with Wenger and Arsenal fondly despite the nightmare that he lived out with his injury.